Bring your own kayak or canoe to New Quarter Park on Saturday, July 20, for an out-and-back paddle on beautiful Queen’s Creek. You can relax while you are led by park staff and see Ospreys, Egrets, Great Blue Herons, and Bald Eagles on the way. Participants should arrive by 9 a.m. and expect to launch by 9:20 a.m. The paddle will last approximately two and a half hours with take-out occurring at approximately noon. The program is free and open to the public. It is recommended that you bring with you water, a snack, and sunscreen. 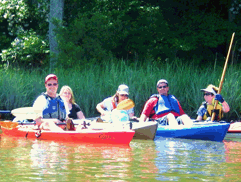 Kayaks are available to rent for this event. Call Parks and Recreation for rental information. New Quarter Park is located in upper York County at 1000 Lakeshead Drive, next to the Queens Lake neighborhood. For more information or to add your name to the New Quarter Park e-mailing list, call York County Parks and Recreation at 890-3500 or New Quarter Park at 890-5840.